Influence of high energy radiation on electronics has been studied extensively over the past few years, as electronics are being used in radiation environments, such as in medical equipment, nuclear reactors or aboard satellites in space. In this initiative, we examine the influence of acute high dose radiation, such as 10-keV x-rays and 662-keV gamma rays, on the silicon surface and, silicon-based optical and electro-optical devices. We found that high energy radiation exposure enhances the oxidation rate of unpassivated silicon surfaces saturating at the typical native oxide thickness of ~ 2 nm. We applied this phenomenon to a silicon based optical device: a ring resonator. Additionally, a novel amorphous silicon solar cell structure will be fabricated by the incorporation of porous amorphous silicon and it’s radiation response will be determined. Enhanced oxidation rate observed on silicon surface due to 10-keV x-ray irradiation. The sample was exposed to dose rates ranging from 5.8 krad(SiO2)/min to 67 krad(SiO2)/min for 180 min. The effects of x-ray and gamma irradiation on the optical properties of colloidal CdTe/CdS quantum dots (QDs) immobilized in nanostructured silicon (NSSi) frameworks are currently under investigation with the goal of developing QD-based radiation scintillators and analyzing QD exciton dynamics as influenced by proximity to complex, disordered states of the substrate. Preliminary investigations of QD exciton lifetimes and photoluminescence intensities show a decrease with increasing exposure dose of x-rays and gamma-rays. (Left) Illustration of CdTe/CdS QD attachment to PSi pore walls and a camera image of the PSi-QD sample under UV lamp (365 nm) excitation. (Right) CWPL spectra for PDDA functionalized PSi before (solid line) and after (dotted line) immobilization of CdTe QDs. CWPL spectra of PSi-QD samples. 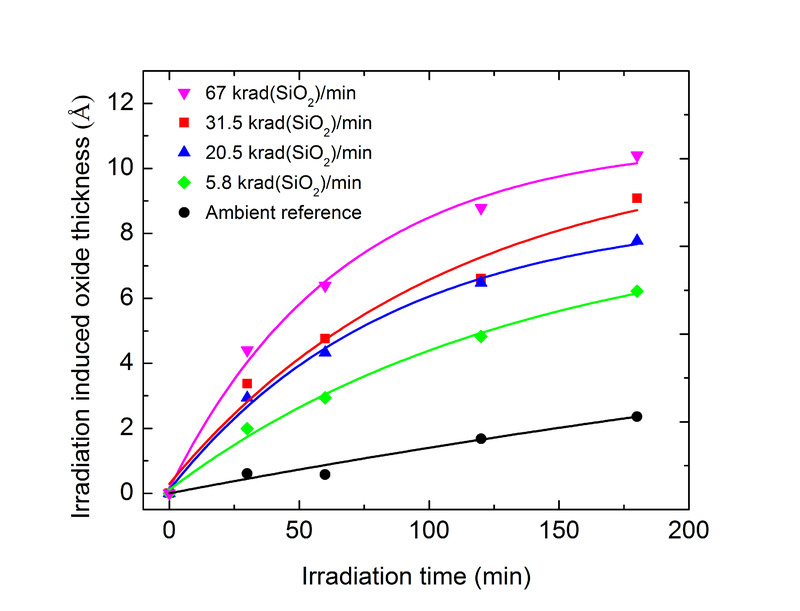 a) QD fluorescence of the irradiated sample before X-ray irradiation (pre), followed by total exposure doses of 500 krad(SiO2), 4 Mrad(SiO2), 8 Mrad(SiO2) and 16 Mrad(SiO2). The QD peak fluorescence intensity decreases with X-ray irradiation total dose. b) Control experiment carried out for same time durations as the irradiations in (a) but the PSi-QD control sample was maintained in ambient environment without X-ray irradiation. TRPL measured at an emission energy of 1.9 eV, showing QD fluorescence lifetime decay. a) Measurements of a PSi-QD sample pre- and post-irradiation at 5.4 Mrad(SiO2) demonstrate a decrease in lifetime from 37 ns to 11 ns ± 4 ns. b) The control sample exhibits a slight decrease in lifetime from 32 ns to 28 ns ± 4 ns after 147 min, a time duration equivalent to the irradiation experiment, compared to an initial measurement. The effect of X-rays on irradiated materials is primarily classified as a point interaction with the creation of several secondary electron-hole pairs. The number of such secondary particles generated can be estimated from the average energy necessary to create an electron-hole pair, which is approximately 4.4 eV for cubic CdTe QDs. The ejection of an electron from the QD core will result in ionization and non-radiative Auger processes that occur on much faster time scales than radiative processes, will initiate a dark state in the QD. As a result, even in the event of absorption of a photon, an excited electron will not decay radiatively to the ground state and instead will transfer the acquired energy to a coupled hole through Coulombic interactions which may then rapidly relax through valence band states.